When you think of "Writing Style" you consider the way the idea is presented, not really the idea, itself. Consider this: a reader picks up a book usually because of content, but more often than not not, puts it down because of style. 1. 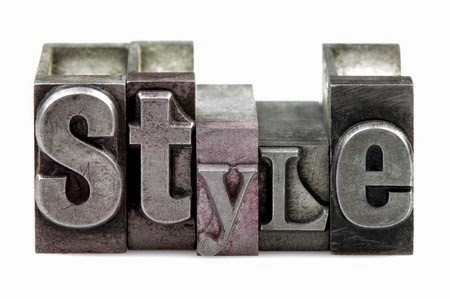 Think About Style - According to Gary Provost, author of 100 Ways to Improve Your Writing "There is not subject that cannot be made more fascinating by a well-informed and competent writer. And there is no subject that cannot be quickly turned into a literary sleeping pill by an incompetent writer." 2. Listen to What You Write. Writing is a visual art. Provost says, "To write is to create music." So, as writers this of yourselves as composers, and think of your words as making muss. You must read aloud what you write and make sure it sounds melodic. Listen for dissonance. Listen for the beat. Listen for gaps in music. Listen for sour notes. Listen for instruments that don't blend well. As Provost says, "Its is the way in which you combine them that can make the writing succeed or fail. It's the music that matters." 3. Mimic Spoken Language. Make your writing conversational. Of course, we're not talking about an exact duplicate of speech, oh, no! What Provost means, is your writing must convey to the reader a sense of conversation. Don't make it an ordinary conversation, make it a good one. 4. Vary Sentence Length. If you tried counting every sentence in every paragraph in every book all you'd end up with would be a headache. If you tried to make every sentence the same length in every paragraph what you'd end up with is a headache. Why? Because it would be boring. The sound drones on an on with no ending. Let your ear help you with this. It demands a variety, as in music, it demands a beat, a rhythm, a harmony. Use short sentences, medium sentences, longer sentences, mix them up. Use short sentences to evoke a sense of urgency. Longer sentences to give the reader a rest. Remember, you're not just writing words, you're writing music. 5. Vary Sentence Construction. In school, do you remember how to structure a sentence? Subject ? Verb? Object? However, ideal sentence construction can bore readers. Of course, you shouldn't go out on a limb and rearrange sentences willy-nilly with no nod to Strunk & White, That's not what I'm saying, however, keep the principle elements of the sentence dancing so they'll create they're own music. 6. Write Complete Sentences. In most cases, a complete sentence creates a complete thought. Incomplete sentences were not acceptable in grammar school. However in the writing world, they do have their place. Provost says, "Good writing often contains incomplete sentences." It's a useful tool -- when USED WISELY and SPARINGLY. As far as Provost is concerned, "...write complete sentences 99% of the time. But now and then if a partial sentence sounds right to you, that's what you should write. Period." 7. Show, Don't Tell. Usually shorter is better. However, it sometimes takes more words to show than it does to tell. That's okay. Description helps. 8. Keep Related Words Together. When you go to a grocery store, even if you've never been there before, you can find most everything you're looking for without the use of a map or customer service. Why? Because they group related items together. Do the same with words. Adjectives should be placed near the noun they describe. Adverbs should be close to the verbs they modify, and dependent clauses near the words on which they depend for meaning. 9. Use Parallel Construction. As the steady of a drum often enriches the melody, the repetition of a sound can improve the music in your writing. Placing words and sounds together by arranging sentences sentences together to show the reader similarities of information contained in sentences is called parallel construction. 10. Don't Force a Personal Style. Similar to a new set of clothes, style is something you cannot force on a person, or your writing. As Provost says, "Style is your writing.... Do not try to write like Erma Bombeck, Hunter S. Thompson, Ernest Hemingway, or anybody else. If you fail you will look foolish, and if you succeed you will succeed only in announcing to the world that you are not very creative."